A couple of weeks ago was V’s 2nd birthday and we had the birthday party at the Seattle Children’s Museum. It was a lunch time party and we ordered some sandwiches from Panera Bread. I wanted to make at least the other sides for the lunch along with the birthday cake. I made some mac and cheese for the kids, along with some of the PBJ Cracker Sandwiches. For the rest of us adults, I made some salad to go with the sandwiches and chips. I wanted to make something that was a little filling and a little different from what people usually have as a salad. I almost went with my usual couscous salad but then remembered this marinated chickpeas salad that I made once this summer. I somehow knew that it would be an instant hit. Well, it was! This salad has a great combination of spice, earthiness, tang and lightness to it that it is bound to please most people at any normal reasonable party crowd. It takes some time though as you need to marinate the chickpeas in harissa and lemon juice for at least a few hours, preferably overnight, for all that goodness to soak in to the chickpeas. You use the same marinade as the dressing for the salad as well, so as to distribute that same flavor throughout the salad – to the cucumber, tomatoes and salad greens. I buy my harissa spice powder from World Spice and buy the paste from Whole Foods. The spice paste I buy from Whole Foods needs to be refrigerated and can be used as it it, to toss with something. The spice powder is a little less spicier than the paste and I mostly use it for marinating and such. 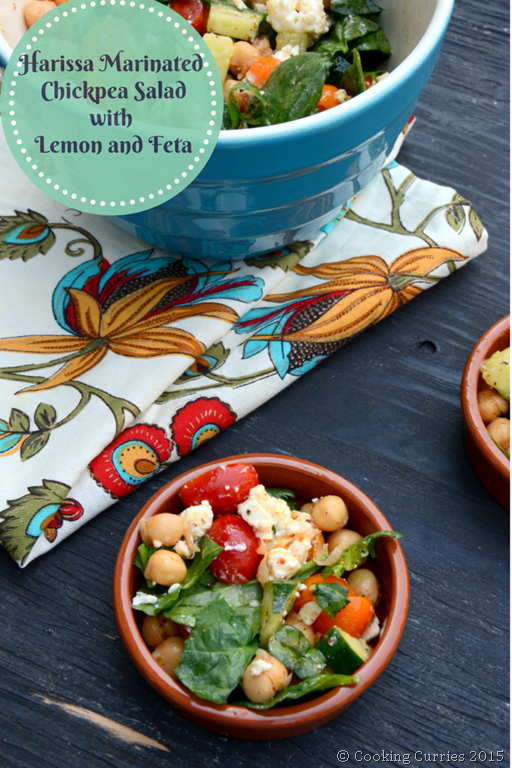 In a bowl, add the chickpeas, harissa, lemon juice, olive oil, salt and pepper and mix well. Refrigerate for 2-3 hours or preferably overnight. 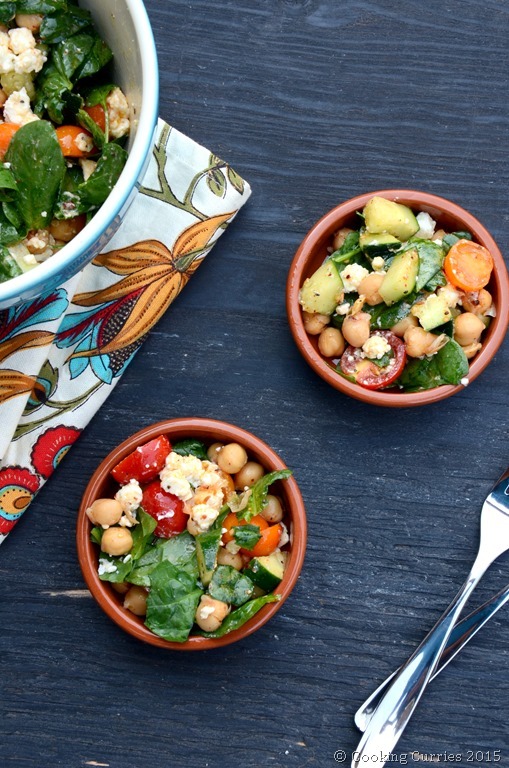 When ready to prepare the salad, drain out the marinade from the chickpea to a bowl and reserve it. 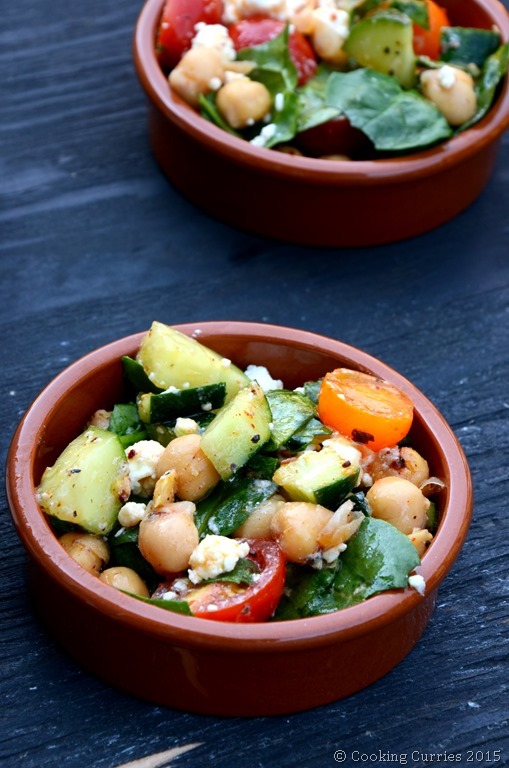 In a large serving bowl, add the salad greens, cucumber, tomatoes, feta and chickpeas. Add the reserved marinade and toss well. Season more with salt and pepper, if needed.